One of the new Allied Races coming in the Battle for Azeroth expansion, the Kul Tirans were first introduced in Warcraft 2, were also present in Warcraft 3: The Frozen Throne, where you once again see Grand Admiral Daelin Proudmoore, and in WoW in Classic (via NPCs Kul Tiras Marine, Lady Jaina Proudmoore, etc.). One Kul Tiran everyone knows, without any knowledge of lore, is Lady Jaina Proudmoore. Jaina, Archmage, once Leader of the Kirin Tor, once Ruler of Theramore, was originally from Kul Tiras, where her father Grand Admiral Daelin Proudmoore ruled and where she is known as Daughter of the Sea. You may have previously seen Kul Tiras Marines in Durotar or Azuna, or you may have been a young Hordie frustrated by the strength of Kul Tiras Sailors. Kul Tiras was one of the main Human kingdoms, and once the proud location of the Alliance's greatest naval fleet. Kul Tiras wasn't just home to the Kul Tiran Humans. It also had a decent population of such non-Humans as High Elves, Dwarves, and Gnomes. The Theramore crests on the Theramore Tabard and Theramore Banner were based on the Kul Tiran crests/symbol/tabard, which was Green and Gold, at the time. Note, Allied Races start at level 20, and with the new level scaling from 7.3.5, Kul Tirans can quest in any zone requiring a 10-60 level range, as long as said zone has Alliance quests. They will unlock after the Zuldazar raid coming in 8.1, and are currently slated for a Patch 8.1.5 release. an additional new quest chain, starting in the Alliance Embassy in Stormwind City. Creating a character of this race requires the aforementioned prereqs, as well as an existing level 110 character on the server where you're making your Allied Race character. 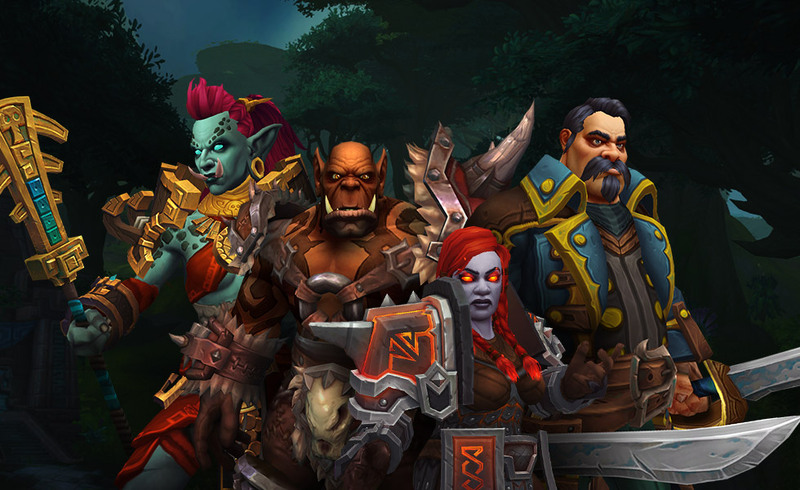 Click the Rectangle saying "Allied Races" on the Character Creation Screen in order to make an Allied Race character. Leader: Katherine Proudmoore?, Jaina Proudmoore? Capital: ?,Boralus Boralus, Tiragarde Sound, Kul Tiras? Racial Mount: Kul Tiran Charger, probably a Horse, possibly this horse. Druid Forms: Interesting Bear form, Cat form, Travel form. Flight form. Boomkin form. Was Really hoping for a Wicker Beast travel form. Maybe Hunter pets? Monk - Many Kul Tirans seem to enjoy a good round of fisticuffs. The Haymaker ties into this. Warrior - Kul Tirans are a hearty, strong race, built like tanks, and very familiar with war. Kul Tiran Mage were unintentionally excluded, it would seem, and are supposed to be an option. Kul Titans have always had mages, though in short supply; given her massive potential, Jaina was sent to Dalaran for training. While it might feel wrong for them to not have mages, Daelin sent Jaina to magical city of Dalaran so she could learn from Mages, so they must not have had a large supply of powerful Mages in Kul Tiras. I suppose Shaman is a good alternative, given Shaman has Water spells, but Mage would have been a welcome addition, as well. Perhaps Jaina could have taught the budding Kul Tiran Mages. Racials: Kul Tiran racials are likely to be sea-oriented. Note: As yet, only the names (and icons) are known, and I can only guess as to which is active or passive. Somewhat surprised to not see an Anchor Snare spell similar to Anchoring Strike, Anchor of Binding, Boarding Grasp, and the like. You can view the Female and Male models in the Modelviewer here on wowhead. Note: Kul Tiran models currently partially broken. Many "extra" parts on gear pieces are not attached correctly / displaying in random locations. Shoulders tend to float too high, and helms are sized incorrectly. These things will probably take time to be remedied. Generally larger than most other Humans. There are also normally sized Human and Thin Human models for Kul Tiran NPCs, but they do not of yet seem to be playable, unfortunately. Skin tones of varying Human colors, including darker skin tone options than Stormwind/Lordaeron Humans, likely due to their Island Nation location. Interesting face options, including wrinkled and scarred, and one with one scarrified eye. Males have a variety of very heavy/thick facial hair options, and VERY prominent chins. Ladies have several medium-length hair options, consiting of ponytails, braids, half-ups, and buns; and their hair ties and barrettes are of a silver metal or leather. Sadly, all ladies' faces seem to have the same eyebrows, at the moment, making customization feel more limited. A great knowledge of and skill with the sea, both in the form of understanding of naval equipment, and command of the sea itself, via their Squall. Formerly the greatest Navy of the Alliance. Some knowledge of and skill with nature, due to their Harvest Witches (Druids, for gameplay reasons). This is likely both a holdover from their Gilnean origins, and a result of their interactions with the Drust. Dialect, societal structure, clothing styles, etc somewhat similar to Gileans. Bring aspects of the sea or navy into most of their lives, including their architecture, which obviously draws inspiration from ships. Like many races in wow, and like other Humans in wow, put a great emphasis on family, particularly when from a Noble family. When an Allied Race character is leveled from 20 to 110 (sans boost), the player gets an achievement that unlocks a set of Heritage armor to use for that race on their account. Main could possibly be the outfit in this image, seen on the Allied Races portion of the Battle for Azeroth page on Battle.net. Somewhat odd, given Kul Tiras' colors are Green and Gold. I'd have expected maybe a green/gold/brown coloration similar to the green/bronze/brown of this datamined outfit, but maybe it'll be a potential for recolors. That said, many main Kul Tiran characters often sport the Blue&Gold combo. See Jaina and her father, et al. These were found in the 8.1 PTR. They seem unfinished, and missing many of the Kul Tiran usuals - larger sleeves around the wrists, large collar. This may be unfinished, or may be a display issue, as Kul Tirans have fairly consistently had with the dressing room, thusfar. Note: Alt colorations for most Allied Races not currently available for player characters. Looking for other Kul Tiran/Human mounts? Quel'dorei Steed - High Elf mount, Kul Tiras has long been known to have High Elves. Chewed-On Reins of the Terrified Pack Mule - Terrified Pack Mule - now seems Horde only :( Supposedly Hotfixed and usable on both factions. Maybe you're looking for an aquatic mount? 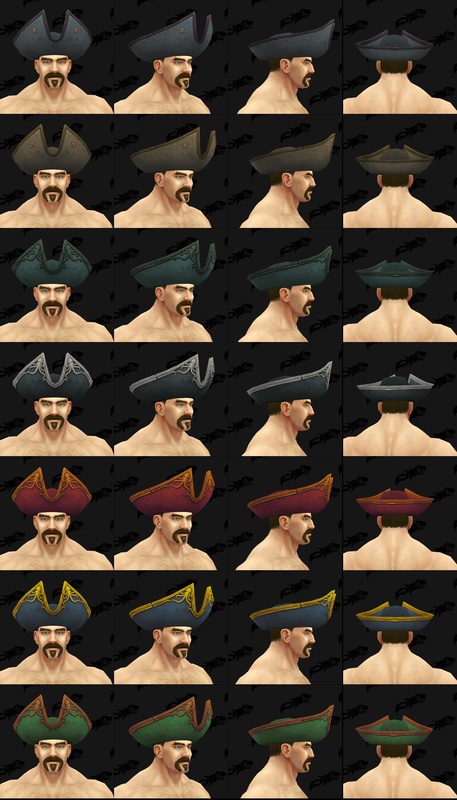 Need some ideas to get your Inspiration started for Kul Tiran transmogrification? 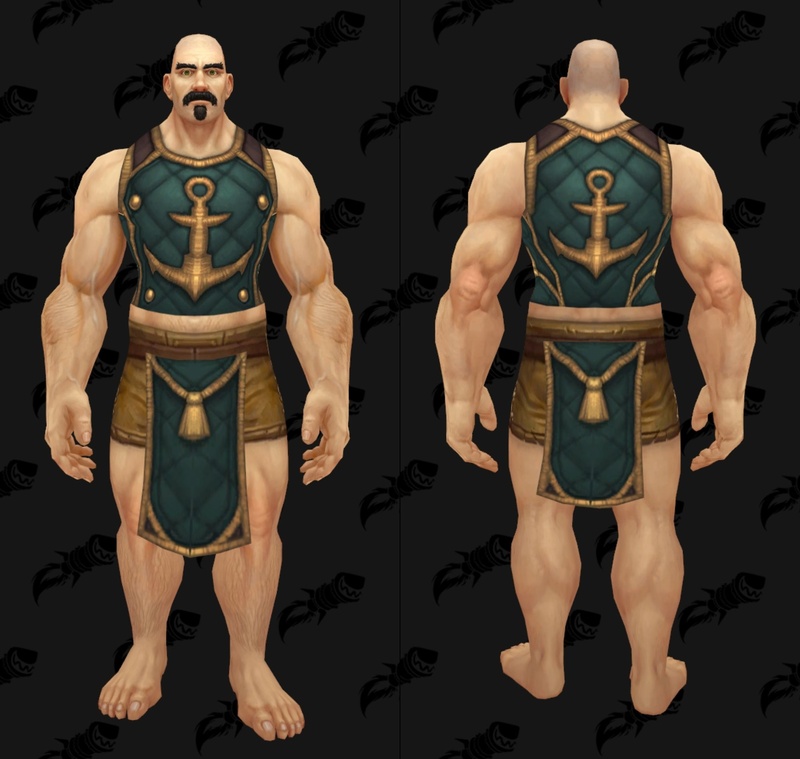 Kul Tirans seem to wear clothing with larger sleeves and/or collars, buckles, hooks, pouches, often with (vertical) stripes and/or patches, sometimes with rope, sometimes with tiny anchors. Coats, Hats, and Caps are also common, with certain hat types mostly worn among the more sea-faring crowd. Blues, Reds, Yellows/Tans, and Greys are common, though Green and Gold are the Nation's colors (Proudmoore Admiralty Tabard). Like with Gileans and Genn Greymane/Genn Greymane, it's unlikely you'll find gear that would match Katherine Proudmoore's, but you'll find many interesting sets while questing and instancing through Kul Tiras. Kul Tirans originally came from Gilneas, a few thousand years ago. Use this knowledge as you wish. Kul Tirans are surrounded by water. Use this knowledge as you wish. Kul Tiras has a huge Navy, and tons of Pirates. Kul Tiras has Druidic people - Harvest Witches/Thornspeakers, who some say use a sort of evolved "death magic" so think bones, twigs and branches. Kul Tiras has Tidesages / Sea Priests, and Squallshapers / Hydromancers who utilize water magics. Kul Tiras is not a warm location. Hence the coats, longer-sleeved shirts, and thicker-looking clothing. Maybe you're looking for a Kul Tiran themed weapon from Kul Tiras quests? Maybe you're looking for a Kul Tiran themed gearset? Gorak Tul's Mantle () - Kul Tiras Instance Drops, Normal? , , - fits the Harvest Witch style "Druid" class. Maybe you're looking for a Kul Tiran or Aquatic themed battle pet? Okay, on the class issue, If the Zandalari do not have Warlocks, and the Kul Tirans do not have mages, the overall race / class combination between Horde and Alliance is even at 87 race/class combinations each. So, by adding mages to Kul Tirans (which I am not against) without giving Zandalari Warlocks, that would make Alliance one race / class combination ahead of the Horde at 88 / 87. As Blizzard has consistently maintained a balance between the two factions, I cannot see them consciously adding the Mage option to Kul Tirans without adding another class to a Horde race..... most logically the Zandalari. Requires you to already have a level 110 character on that server. Does that mean that all kul tirans start at that same level? Otherwise, I see absolutely no point in this requirement. It makes no sense, it's just an annoyance. Why won't Blizzard replace the fat model with a regular human model, but with green tattoos? So we can get Loremaster by doing the different zones on different characters and have it count for flying, but we need to complete everything on one character for the race unlock? Learn more about racials, customization options, heritage armor, and more in the Kul Tiran Human Allied Race Guide.